Like so many who never outgrow their fascination with cars, I owned too many toy cars long before I owned too many real cars. Seldom were the trips to the store where I wouldn’t come home with a pint-sized car toy courtesy of my obliging parents. My love of all things vehicular has made gift shopping a blessing and a curse for my family, as evidenced by my newest pair of toys, built for the long haul by Corgi in Great Britain. 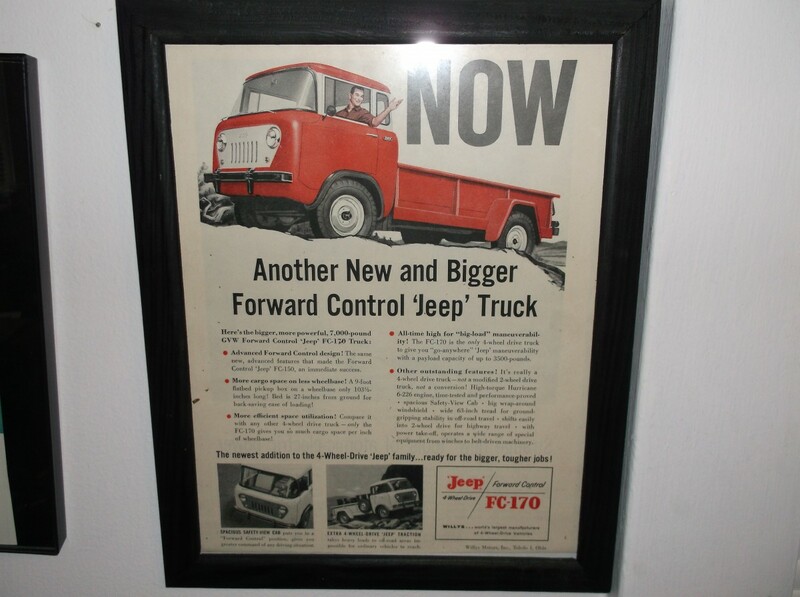 My latest infatuation with FC Jeeps began innocently enough. My lovely bride came home from work a few months ago after a country sojourn in which she noticed a beat-up old snowplow. “I think it might be a Jeep,” she said. We loaded into the Firebird and returned to the scene of the crime where, sure enough, someone had converted an old FC-150 into a snowplow, and I was smitten in a way in which I’ve been smitten countless times; it was love at first sight. Disregarding the notion that an FC Jeep has to be among the most inherently unsafe and unsuitable cars for modern traffic outside of a Model T, my heart sang songs of innocent love. My wife doesn’t particularly love being an enabler, but she does take advantage of gift ideas when they present themselves in so obvious a manner. Therefore, she began her “Operation FC” onslaught with this advertisement she gave me for my birthday last month. Then, for no particular reason, late last week she presented me with this far from perfect (which makes it perfect) FC-150. It’s easier to store than a dedicated snowplow, it’s the perfect color, and it’s what we call an “Aaron Special,” which means that it exudes the perfect mixture of “used and useful” that I look for in any wheeled vehicle. I love it. Less immediately enthralling but just as fun was the trailered “Cooper-Lotus” that came with the Jeep. Judging by my quick research, it’s a Lotus 25 with a Coventry Climax 1.5-litre V8, which would have aligned nicely with the Formula One rules of the time. It reminds me most of Jim Clark’s 1965 Indianapolis 500 winner, the same car that is now owned by The Henry Ford, although that car would have been somewhat different in design and general purpose. 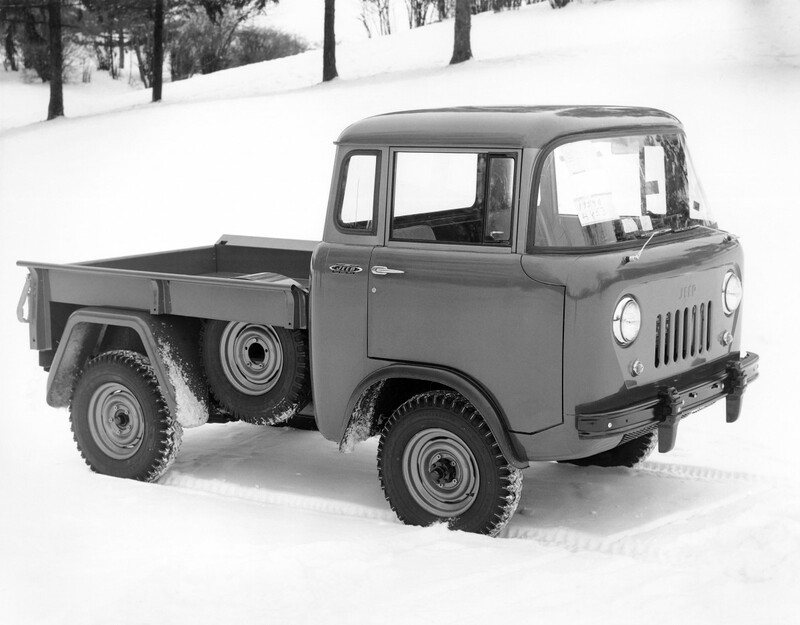 One thing I do know: It seems unlikely that the factory Lotus F1 team used a Jeep FC as a tow vehicle. No matter–in my life’s fantasy, we don’t worry about insignificant anachronisms such as those. Someday, if my wife and I make it out of the city and into the “just rural enough” land of our dreams, maybe I’ll own my own full-size FC snowplow. Until then, I’ll enjoy the fruits of what my coworker calls my “fantasy marriage,” and find a nice place to park my new toy. Love these articles. Mrs Aaron65 certainly knows the way to your heart. I’m cultivating a similar disease in my nephew hes just turning five loves trucks,diggers, machines, and now cars, I’ll add to his collection this month again, took him for his first ride in a real truck a couple of weeks ago couldnt get the grin off him, One more gear head comin right up. The model maker apparently decided the spare had to be held by a ‘cup’, so added the ‘cup’. On the real thing, the spare is lugged to a bracket on the side of the bed. It could have been glued or bolted on the model, which would have been simpler than the ‘cup’. I sometimes pull similar tricks when making digital “models” of cars or houses. This piece SHOULD have been there, so I put it there. Inauthentic but satisfying. Satisfying indeed, and a good idea is a good idea, no matter if the original builders included it or not. Take my plan for a Bentley-powered 12-cylinder Miata, for example. It’ll work, I tell you! AARON65 – In the 1950s, say 56 or 57, our family would watch TV together on Sunday nights. One of the shows (Bonanza maybe?) was sponsored by Jeep and their ads would show FCs going up and down incredibly rough terrain. As a young car freak I was fascinated by these odd but tough vehicles. Kaiser Jeep sponsored Maverick. They sold a Maverick Special version of the Station Wagon. I have the Corgi FC and my brother has the Lotus. They sure racked up some miles when we were kids. I’ve also had a lifelong thing for FC’s, but the Corgi is as close as I’ve come to owning one. The long bed FC 170 with a 226 Super Hurricane and an overdrive (or maybe a newer 4.0 with fuel injection backed up with a 5-speed) would be my preference, however. A great article, and man does this bring back memories. 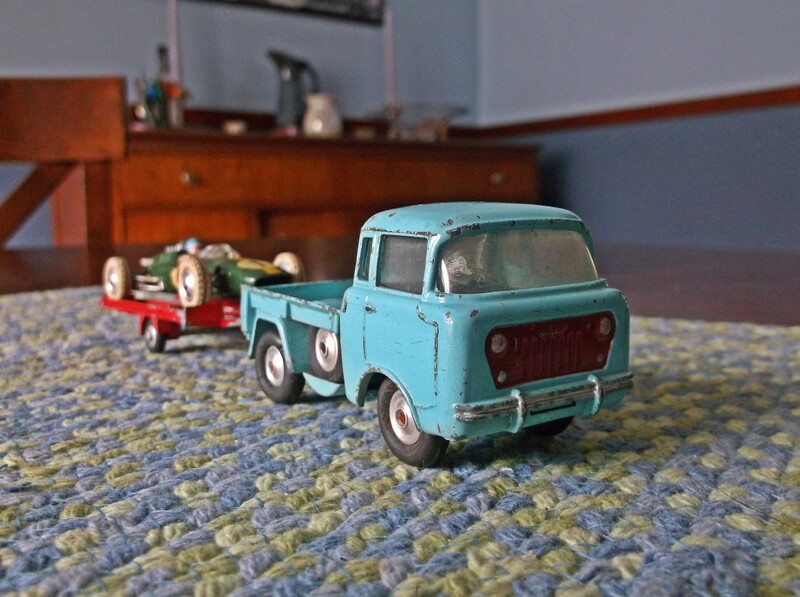 I had a wonderful and much-loved Corgi collection growing up: tanks, trucks, planes, cars…. Unfortunately they went in an estate sale when my parents passed away; I was too depressed to pack up the house anymore. Hopefully some kid somewhere is having as much fun with them now as I used to. Your wife is a gem. Give her a big hug and tell her how special (and thoughtful) she is. Very nice! I wonder which is less practical on the whole – your FC snowplow or the Stude Zip Van that I had a recent torrid love affair with before finding some inner strength. Oh well, if we were all practical people, we wouldn’t be here so often. 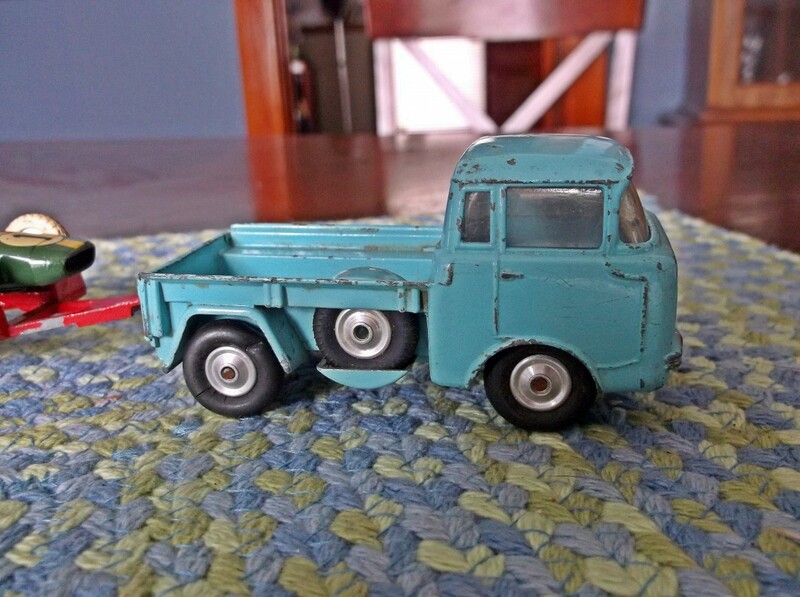 When I was a small child, in the ’70s, I had a toy FC-150 tow truck, so I’ve always known that the FC-150 existed, even though I’m not sure that I’ve ever actually seen one in person. I had several of these toys. Besides the FC-150, I remember that I also had the 1960 El Camino, the “Squarebird” era Thunderbird, the SWB Land Rover, the Peugeot 403, and possibly a few others. I think I had both the Corgi Lotus and the FC Jeep, though I thought my FC was white with some business name on the side. As for real FC’s, on a recent bicycle ride through Cazadero, California, I passed this place http://www.willysamerica.com/index.html – definitely FC (and all old Jeeps) heaven! I highly recommend a drive-by at least if you live anywhere nearby, or are visiting Sonoma on vacation. Wonderful! Brings back memories when I was a kid collecting toy cars. Matchboxes, a lot. 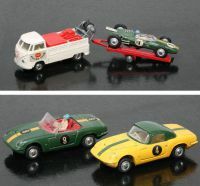 The penultimate Corgi toy car model was (and is) the James Bond Aston Martin DB5 with the ejector seat – remembered that one! The wifey is definitely a keeper, man! I had a tootsietoy FC as a kid…aside from seeing a few rusting out up in NJ (former plow and/or gas station service rigs) and in my Jeep catologs, that’s about the only way I knew of the existence of these. Here in OR, you can actually see them from time to time in various states of repair. Crumple zones be damned! Id daily drive one of these in a heartbeat. Risk of an injury in a wreck…sure its significant. But that’s a small price to pay in order to avoid the certainty of boredom in something more ‘sensible’. My fleet consists of Chevrolets, a Rolls, 2 Jags, a Packard, a Viper, a Firebird, ’32 Ford highboy roadster with flattie power and too many others to mention…all toys, lol. I LOVE this Jeep! And the race car! I had a pretty good Corgi collection in the late 60s and 70s, but I don’t recall either of these models.so perhaps they were UIS only? either way, I fully share ypouir delight at having it. I recently got a model Rover SD1 in very patinated Esso racing colours. Pride of place on the book case behind me now! The Jeep made me think of the Mercedes Unimog as a first reaction. I didn’t know of that Jeep. The race car is cool too. 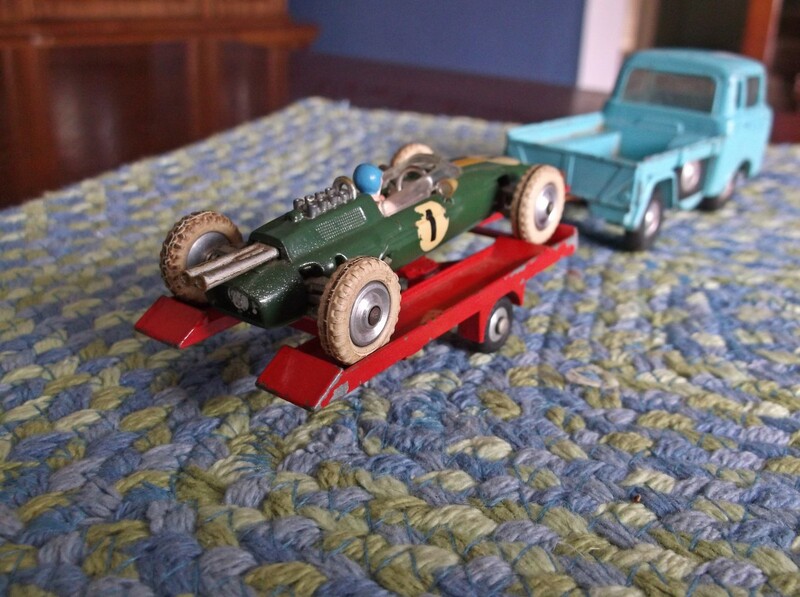 I used to have British racing green Lotus model made by Schuco. It had a functional multi-link rear suspension, functioning steering and to top it off: the differential was open to view and also fully functioning. IIRC it had a wind- up motor. Remeber when the F1 field had constructor-drivers? Jack Brabham, I liked him a lot because he was a constructor-driver. Can you imagine Lewis Hamilton or Sebastian Vettel manufacturing his own car? 2016 is the 50th anniversary of ‘Blackjack’ Brabham’s F1 world championship in a Brabham/Tauranac car. The first and only from a constructor/driver. Article sometime later this year. I’m always fascinated by the Repco engine Brabham used, which was VERY loosely based on the old aluminum Oldsmobile (by way of Buick) 215. Definitely. They started with modified production blocks but ended up doing their own, and one version of the cylinder head had an intake and exhaust valve on each side of the head; surely a plumbers nightmare! I took some photos of Matchbox toys that my sister’s kids now play with when they visit their grandmother back at Christmas, I must do an article on them. What a fantastic gift! My wife has enabled my collection of “little cars” as she calls them, most significantly by buying me a 1:18 Audi V8 Quattro resin model that I’d mentioned on several occasions, but for this to appear unbidden out of the blue is special indeed! I don’t have any Corgis in my collection though–I’m guessing that by the 80’s they either were no longer sold here or were hard to find. What scale would this be? 1:43? I agree that the less than perfect condition adds to the charm! Makes it look like a working vehicle that has actually worked. Pretty sweet! Your lovely wife, that is! I like the FC/Trailer, F1 racer, too! 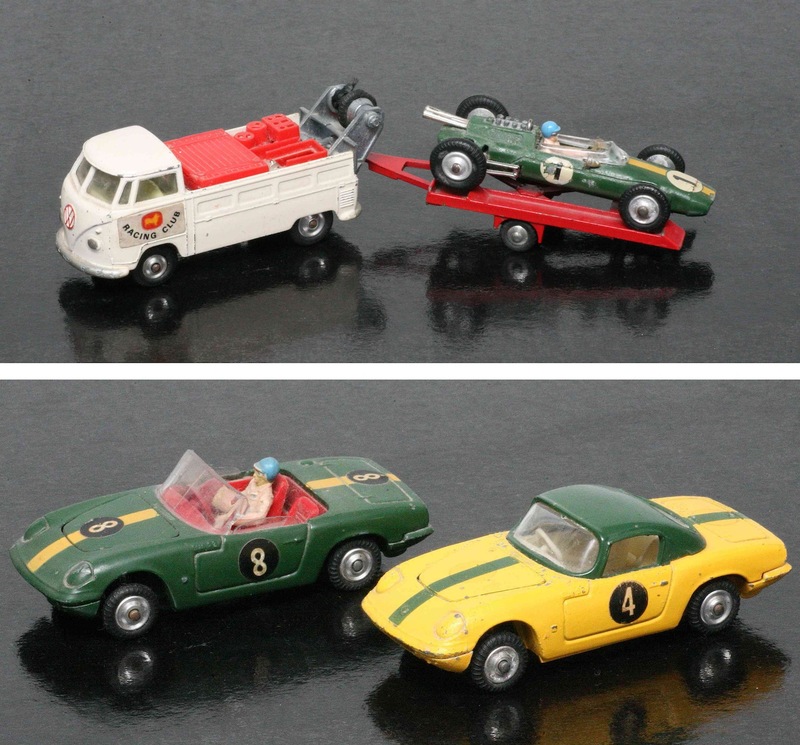 Right up my street; model cars. This is an elderly volkswagen towing the exact same model as you have. It should be towing the pair of Lotus Elans, including a spare chassis. Probably been my toys since the early 60s. Must be over 50 Matchbox cars and trucks buried under the fig trees in my dad’s back yard. 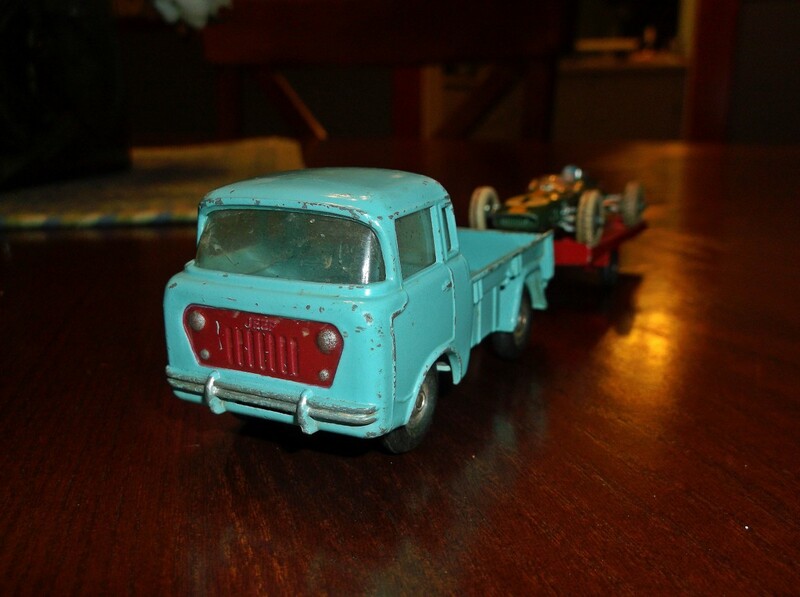 Dad would spoil me with a Matchbox on trips to TG&Y, Woolsworth, and McCory’s. House has been sold for years. Hope there’s some kid who can appreciate the treasures in the back yard. McCrory’s! I’d forgotten all about that place. There was one in the mall in our city for many years, until it finally departed in the early 90’s. I remember browsing the Matchbox and Hot Wheels selections there on many occasions, though the majority of my collection was acquired at Kmart. I remember one Woolworth in town, though it was declining by the 80’s. TG&Y I’ve never heard of. If the FC Jeep was tricky to drive, would the same have been true for the VW/Ford/Chevy/Dodge products with similar profiles?